We've been around antiques for a long time and started in the kerosene lamp market. When customers come in the shop they are surprised by the vast selection of oil lamp parts we still offer. Most people with access to electricity are not interested in the hassle of kerosene. 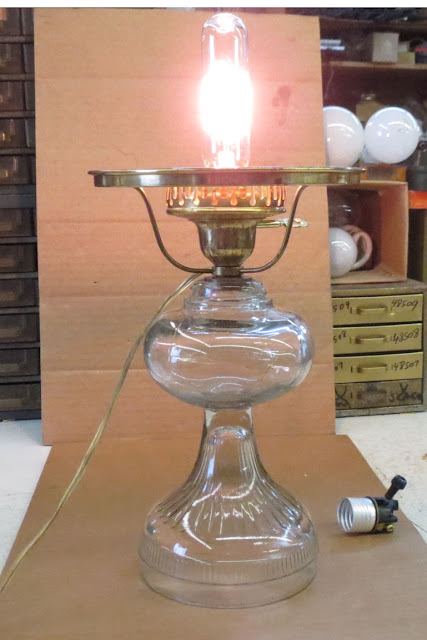 The option to have an electric socket on an oil lamp is a nice alternative. Like any lamp they need repair from time to time. A customer brought us this lamp the other day and complained it was crooked and loose at the socket. A quick inspection of the usual items: polarized plug, socket interior, and socket insulator were all good. Although we will not need any lamp parts for this repair, we will still need to tighten everything up. First we remove the socket and shade holder from the lamp body. This lamp is using a #2 adapter for electric conversion. It unscrews from the collar on the lamp body. Next we pry the socket shell from the socket cap. The socket interior is removed from the lamp cord and set aside. This lamp has been loose for a while and been spinning and spinning on the cord. We cut the spun cord off and discard it. The 6-8 inches of cord will not be missed. Next we pull the cord down and out of the adapter. Then the adapter and the socket cap are tightened. With the problem fixed, the lamp starts to be reassembled. First we thread the lamp cord back in the adapter and up the socket cap. Then we tie a UL knot in the cord and reattach the socket interior. The socket key is attached to the interior and the socket shell is slipped on the interior. The socket shell snaps back into the socket cap. Any cord slack is pulled back through the adapter. Now the electric burner and #2 adapter are screwed back on the lamp body. Be careful not to over tighten the adapter in the lamp collar. 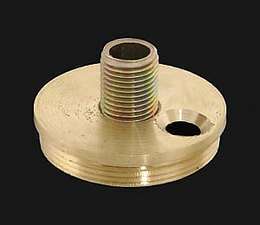 Brass is a soft metal and the threads can easily be damaged. A bulb is added and the lamp is tested. Great! Total cost $0 Total time < 20 minutes.